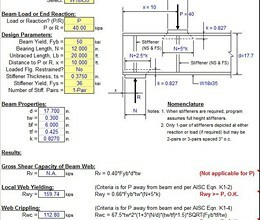 STIFFNER is a spreadsheet program written in MS-Excel for the purpose of analysis of steel beams subject to concentrated loads. 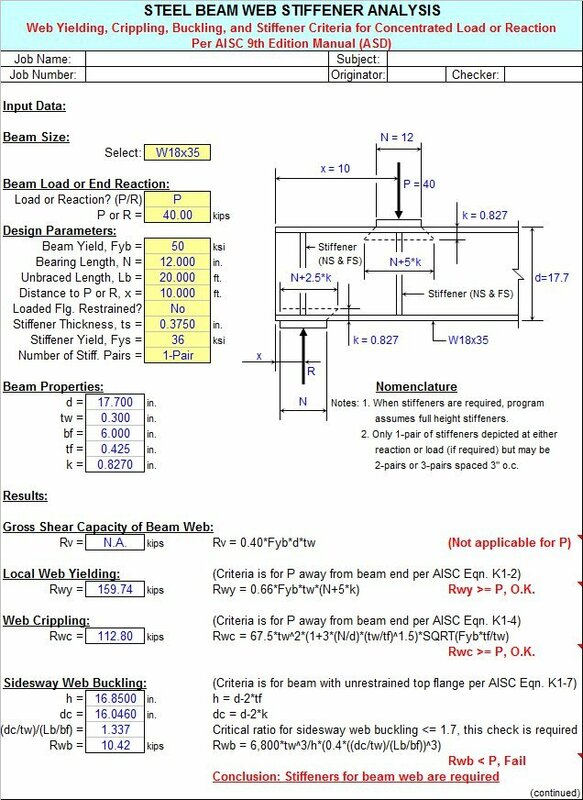 Specifically, web yielding, web crippling, and web buckling criteria are checked to determine if web stiffeners are required to resist the concentrated load. If stiffeners are required, the stiffener size and weld requirements are determined. 1. This program follows the procedures and guidelines of the AISC 9th Edition Allowable Stress (ASD) Manual for wide flange beams subjected to concentrated compressive loads per Chapter K, pages 5-80 to 5-83. 3. For the purpose of determining the total composite section to be considered for resisting the compressive load, the program assumes a spacing of 3" center-to-center between the stiffener pairs. * STIFFNER download link provides freeware version of the software. STIFFNER has been rated 5.0 out of 5 points. A total of 3 votes cast and 0 users reviewed the software.